Denis Papin was born in Blois, France on August 22, 1647, the son of a royal official. Although his family was Cavinist he attended a Jesuit school in Blois and in 1661 went to the University of Angers where he graduated with a medical degree in 1669. He practiced medicine for two years, until he accepted the offer of Christiaan Huygens to come and work as his assistant. The position was a combined research assistant/curator post at the newly established French Academy. He published several papers jointly with Huygens detailing their experiments with an air pump, and he published a book detailing his experiments to determine the weight of atmospheric air in 1674. The following year Papin went to London, probably because of his Protestantism, which made his life in France difficult. In London he obtained a similar position to the one he had in France at the Royal Academy, with the assistance of Robert Boyle, who had read his book. At the Royal Academy he continued his experiments on atmospheric weight and did experiments with steam. During his tenure at the Royal Academy he invented a pressure cooker that extracted nutrients from bones and other things not normally digestible by humans. This was probably the most profitable invention of his but he gained little in the way of payment for it. One interesting feature of this invention was a valve by which excess steam could be let off, similar to valves used in later steam engines to prevent dangerous over pressurization. In 1681 he went to Venice, but returned to London three years later. Later he was invited to take the chair in mathematics at the University of Marburg, where he married his cousin who was a widow with a daughter. The remittance for this position was less than what he required for his new family. 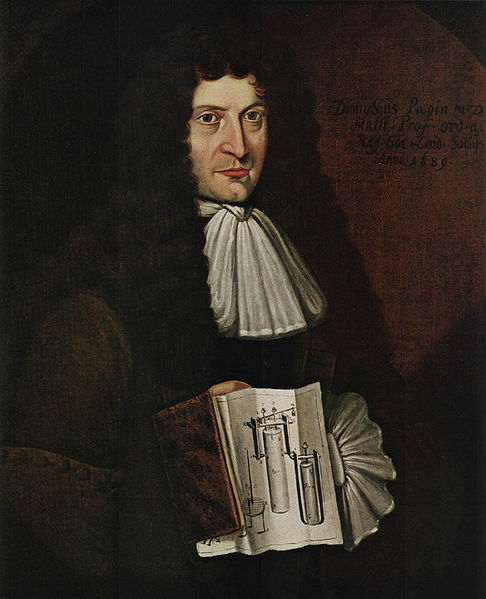 In 1696 he moved to Cassel there he was able to complete experimental designs including a centrifugal pump, a diving bell and a submarine boat. He also concieved of ways that mechanical power could be transported over a distance by means of a vacuum tube. He received requests from mine owners for assistance in removing water and ore from their mines. Although he cannot be credited with the invention of the steam engine, his researches were pivitol in its development. He remained in Cassel until 1707 when he returned to London, leaving his family in Germany. He presented a few papers to the Royal Academy, but he was largely destitute. The last surviving evidence of his existence is a letter dated January 27, 1712. It is believed that he died thereafter and was interred in a paupers pit grave.